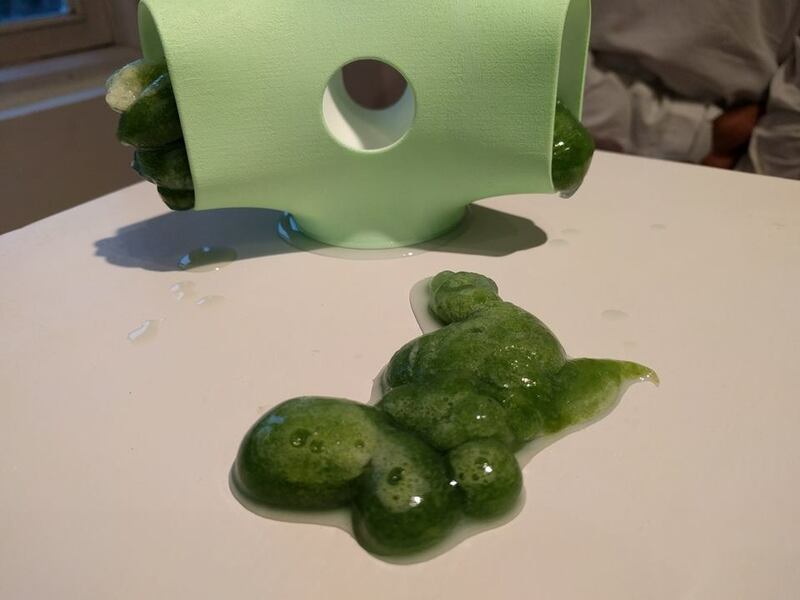 Home Biotech Special: The Undivided Mind-Where Art meets Science! One of the models "Entangled bodies" featuring spirulina algae by Johanna Schmeer Germany. New Delhi: There are hardly many instances where creative artists talk about science and at the same place, we have scientists known for their logical approach, express appreciation of the unique display of scientific models through art. However, the bridging of this gap between two streams of intellect happened recently at Delhi. 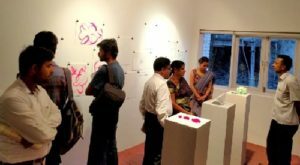 The Undivided Mind, Art and Science residency at Khoj International Artists Association, from March 7 to April 15, 2016, explored the distinct yet connected fields of art, science, health, technology and design. The seven artists, from India and abroad, were selected through a competition and brought with them different artistic insights and expertise and a keen interest to engage in a dialogue with scientists and other practitioners of STEM (Science, Technology, Engineering and Medicine) and social sciences. During the six weeks the artists explored various science and health-related themes ranging from, terrestrial and extra-terrestrial experience of a four-armed human being, “tub of loss” to experience the loss of body (similar to in space), urban laboratory for birds, wearable sculptures to protect from air pollution and a body suit mimicking microorganism invasion of our bodies. The artwork also reflected on human conditions such as abnormal perception (schizophrenia) and hysterectomy. Visitors take a round at the exhibition held at Kirkee Extension, Delhi. The Open Studio Day at Khoj exhibited work by Tyska Samborska (Poland), Gagan Singh (India), Johanna Schmeer (Germany), Mohan Polamar and Vivek Muthuramalingam (India) Alexey Buldakov (Russia), and Sonia Khurana (India). The artwork was presented as a collection of photographs, videos, sculptures, sketches and installations. This Art and Science programme was supported by the Wellcome Trust-Department of Biotechnology India Alliance through its public engagement programme. During the residency, the artists also got the opportunity to interact and engage in conversations with social scientists, science writers, philosophers and artists during a two-day public lecture series that invited eminent speakers such as, Anil Ananthaswamy, Milind Sohoni, Bishnu Mohapatra, Sanil V and Ashis Nandy who touched upon answers to questions such as, “how do these two cultures (of art and science) define the mind, the self and the other? How does the greater project of science influence how we organize our lives, our politics, society and culture? Can the arts provide a critique of the scientific endeavour or help express the cultural ambivalence towards the promise that science has offered?”. Besides the exhibition on April 16th that was held at Khoj Studio, Kirkee Extention in Delhi, few short films on the theme of ‘Health’ from Vienna based Art-Science organization BIO-FACTION were screened too at the venue. 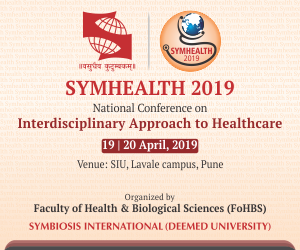 The Unidivided Mind, attempted to bridge the gap between the discursive fields of art and science through the development of artwork inspired by and which used concepts of science and health, in addition to providing a platform for conversations between the two. We surely need more of this in future and let us hope that initiatives like these to break barriers keep going on!